One of the oldest advanced techniques of gardening—and one of my favorites—is espaliering, which involves shaping woody plants into two-dimensional shapes. Now, in bare root season, it’s timely to consider this tree training technique. Espaliering has been traced back to the walled gardens of Persia, as long ago as 4,000 B.C. It was practiced during the Roman Empire and developed further during the Middle Ages. There are good reasons for training trees or shrubs into relatively flat shapes. The primary reason in many situations is to garden productively within a limited space. Adding one fruit tree might be possible in a smaller garden, but even trees growing on dwarf rootstock can require a ten by ten area, plus some walking-around space, for cultivation. A gardener could use this tree training technique to grow several different trees in the same 1oo square feet. Espaliering is especially useful in narrow spaces along a driveway or sidewalk, or between the house and the property boundary. 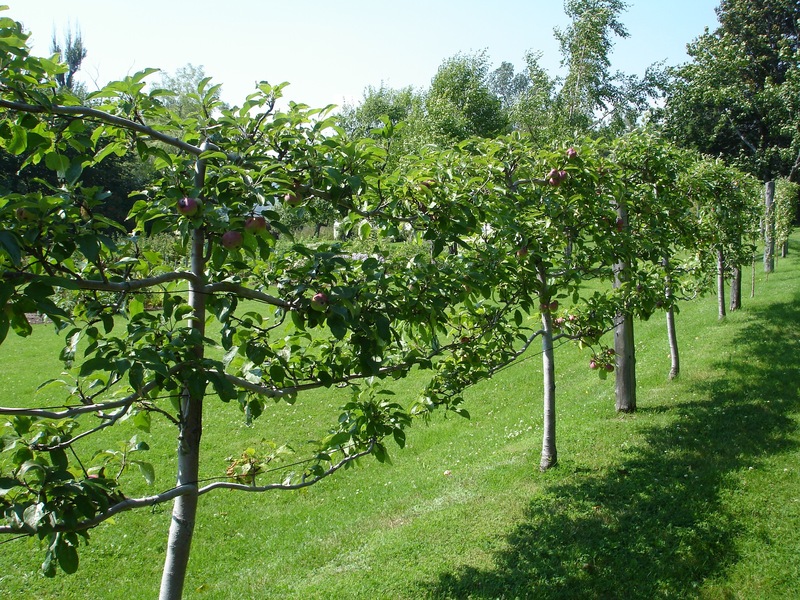 With an appropriate training plan, the gardener can maintain a row of fruit trees at a height of three or four feet, in a low profile that is both accessible and attractive. Reader Bob Lippe of Seaside photographed this apple tree near a chateau in the Loire Valley, in France. The tree was being maintained at a height of only two feet. If you have a space for which you might like to grow an espalier, check first to determine whether sun exposure is sufficient for the plant(s) you would like to install in the space. The most popular plants for espaliers are fruit trees, particularly apples, apricots, cherries and pears. In addition to fruit trees, other plants also can be grown in flat panels, including berries and climbing plants. All the popular fruit trees—and most fruiting or flowering bushes or vines—require six or more hours of direct sunlight each day. Specific fruit tree varieties will perform better than others in the Monterey Bay area, so it would be prudent to do a bit of research before buying a tree for this purpose, or any other garden use. Local garden centers usually offer only varieties that are appropriate for the immediate area. One could also seek the advice o the local chapter of the California Rare Fruit Growers < http://www.crfg.org/>. In addition to making good use of limited space, espaliering has at least two additional benefits. One is to increase a fruit tree’s productivity. Training a tree to a two-dimensional form emphasizes horizontal branching, which maximizes the development of fruiting spurs. In addition, the flat form exposes more of the branches to sunlight and air, which promotes fruiting. The second additional benefit is the opportunity for creative expression. Over the years, gardeners have developed many patterns for shaping the branches of trees and shrubs: fans, candelabras, and multi-tiered shapes are simplest to manage and most popular. A special form of espalier, the cordon, is a single-trunked tree that develops spur clusters along its length. In this approach, branching is avoided and the trunk is trained to forty=-five degrees to the horizontal. 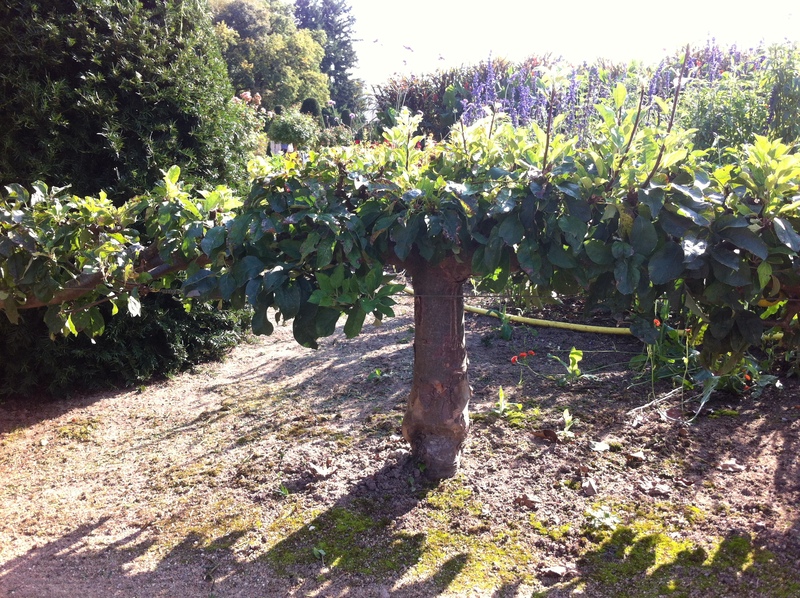 A variation, the step-over design, brings the trunk to the horizontal, forming a low border. For advice on growing fruit trees, attend a fruit tree workshop, such as those offered by the Friends of the UC Santa Cruz Farm & Garden: call (831) 459-3240, email casfs@ucsc.edu, or visit the Brown Paper Tickets website at http://tinyurl.com/workshops2015. For specific information on espaliering, visit a bookstore, public library or Amazon.com for Allen Gilbert’s “Espalier: Beautiful Productive Garden Walls and Fences” (Hyland House, 2009). Any of several other more general books on pruning also would be helpful. Visit your local garden center now for an early selection of bare root fruit trees. This entry was posted in Essays 2015, Winter Quarter and tagged Cultivation, Edible Plants, Espaliers, Pruning, Trees by tomkarwin. Bookmark the permalink.